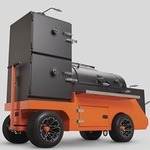 Yoder Smokers Community Forum • View topic - Abilene 20"
After using an Oklahoma Joe (US built) charcoal grill since 2003 I have up graded to a Yoder Abilene 20. A local grill shop had one in stock and made me a killer deal on it including delivery and a cover. I am more of a grill guy but I like to smoke as well. After seasoning it on Saturday afternoon I smoked beef short ribs, baby back ribs, and grilled 4 rib eyes on Sunday. I used charcoal in a snake shaped fuse method with hickory chunks every 10" or so. I kept the temp on the left side around 250 for 5 hrs without adding additional fuel. My concern was heat management without an off set fire box. No worries. Stack vent all the way open and right baffle between 1/8 - 1/4 open. Clean up was a breeze on Monday morning. I highly recommend the Abilene 20" if your budget is tight and you want to grill and smoke. There is more than enough rom to cook for a crowd of people and prepare a variety of meats at the same time. I have not seen any reviews of the Abilene grills online so if anyone is wondering about the capability of it, now you know. The thick steel and air flow is great. I'm an American who will buy US made products whenever I can. Ruger and Henry firearms, US made vehicles, and the best US made grills and cookers. Thank you very much for your awesome review. Thanks for sharing your thoughts… I sent you a private message about potentially using them on our public-facing pages. One month update... I've been cooking every weekend since my purchase and I've been building up to a packer brisket. I've smoked turkey drums and chicken thighs, full racks of spare ribs, beef short ribs, pork butts, and country ribs. This weekend I smoked a packer brisket. Choice grade, 9.5 lbs., with salt, pepper, and a dash of chili powder. I started with a full chimney of charcoal and let the Abilene warm up to 250. I then used oak splits in the coal bed to maintain heat. Fire on the far right side and meat on the far left. It took 5 hrs to get the bark I wanted then I wrapped the brisket and let it cook for another 4 hrs. I took it off at 195 and let it rest for one and a half hrs wrapped. I sliced off a few pieces of the flat. The smoke ring was almost 1/2" and the pull test was perfect. The fat in the point was melted and all I can say is OMG good. I'm sure I can improve some with technique and fire management. I've pretty much been following the guidelines for smaller offset smokers for fire management, air flow, and temps. Living in the NW oak and hickory are not easy to come by but I found 1.5 cf bags of oak, hickory, mesquite, Apple, and pecan at sportsmans warehouse. I used about 1/2 bag of oak for a 10 hr cook. Pretty good in my opinion. Yoder has provided me a great tool to create some tasty meat dishes and be able to hang out with my family and friends while anticipating the end result. Thank you for this forum and all the great information from the experienced pit masters.